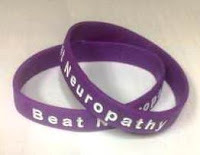 May 14–18, 2012, is Neuropathy Awareness Week. Peripheral neuropathy is one of the most common chronic diseases in the US—over 20 million Americans suffer from it. Peripheral neuropathy or "nerve damage" disrupts the body's ability to communicate with its muscles, skin, joints or internal organs. Peripheral neuropathy can be compared to the body's electrical wiring system breaking down, causing numbness, pain, weakness and poor coordination. For those who struggle with it, neuropathy is a 24/7/365 battle. Increasing awareness and understanding of neuropathy—and its impact—will drive the allocation of more funding for neuropathy research and, ultimately, the discovery of more therapies and cures. You can learn more about neuropathy and helpful resources by visiting The Neuropathy Association at www.neuropathy.org.